Apple has customized its latest iOS 12 version for Apple users who using home button less devices. Now the users do not need to swipe up from the downside of the screen in order to get access to the control center, instead, all the devices without home button will swipe down from the top right corner of the screen. This change has been made by Apple in iPads and some of the iPhones which do not have Home button support, while for other devices, access to control center is the same as it was in the previous versions of iOS. You need not to worry because everything else is the same as it was before, Apple has just changed the way to access the control center. As we have already told you above that this change is only for those Apple devices which do not have a home button support. This includes all models of the iPads and some of the iPhones that don’t have home button like iPhone X, iPhone XS, iPhone XS Max and the iPhone XR. Unlock your iPhone to open the Control Center. From the top right corner of your iPad’s or iPhone’s screen where the battery indicator is located, swipe down to access control center in latest iOS 12 in any of your iPad and iPhone. You will see that the control center is as same as it was in the previous versions of iOS except it has changed its way of appearing on the screen. Now swipe up to dismiss the access of control center again. To close the Control Center just swipe-up anywhere on the screen of your device or just tap on a empty area of the screen where you don’t see any action item like icon or button. Do you know? You can customize the Control Center, give it a try and add some new icon for quick and easy access from you home or lock screen of you device. You can also try the 3D touch on the Control Center icons to see more related options. Like for flashlight you can set the light intensity by using 3D touch on the flashlight icon. On calculator you can copy the last result. Give it a try and you will be surprised with some option that you might not know. If you are not having access to the control center from the lock screen, the reason might be the setting of your iPad or iPhone. In the iPhone, access of the control center from the lock screen is usually enabled by default but the case is not the same in the iPad. It is usually disabled by default in iPad. So if you are having an issue of not accessing control center from the lock screen, do not worry you can enable it by just following simple steps. Unlock your device and tap on Settings app. Tap on Touch id & Passcode. Enter your passcode to access the other options. Now scroll down and there you will have an option of Allow access when locked. From that list find the control center and turn it ON as it will go Green. Now go back and lock your device. Swipe up or down (whatever way your device works with the control center) to check whether it is working or not. 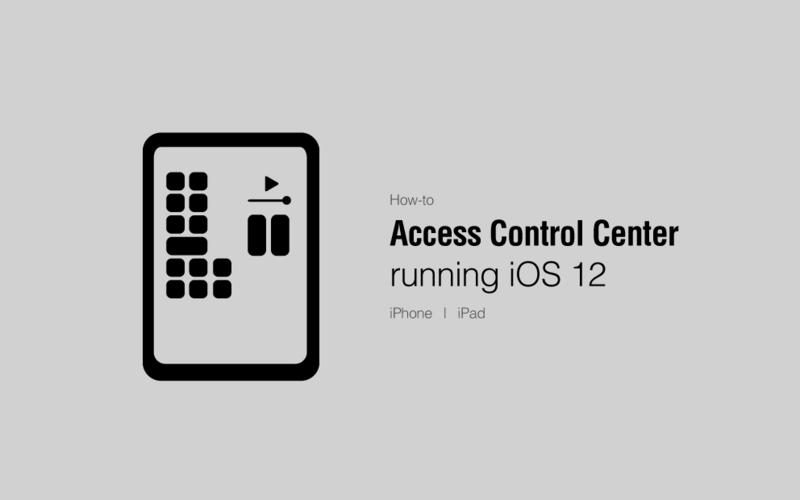 In this guide now you know how to access and exit Control Center on your iPhone X, iPhone XS, iPhone XS Max, or iPhone XR. What do you think the way Apple changed to access the Control Panel? Which method do you like the old one of the current? Leave a comment below.